Even majorities in the three precincts split off from the rest of the county in 2011 redistricting voted in favor of the existing system. The ballot item is nonbinding, but District 117 Rep. Regina Quick said before the election she would be watching to see if citizens expressed views consistent with county leadership, which opposed the split of the county into two districts. Rep. Chuck Williams from the 119th said after the vote he will be interested in what the Oconee County Board of Commissioners will say now that at least some voters have spoken for the status quo. 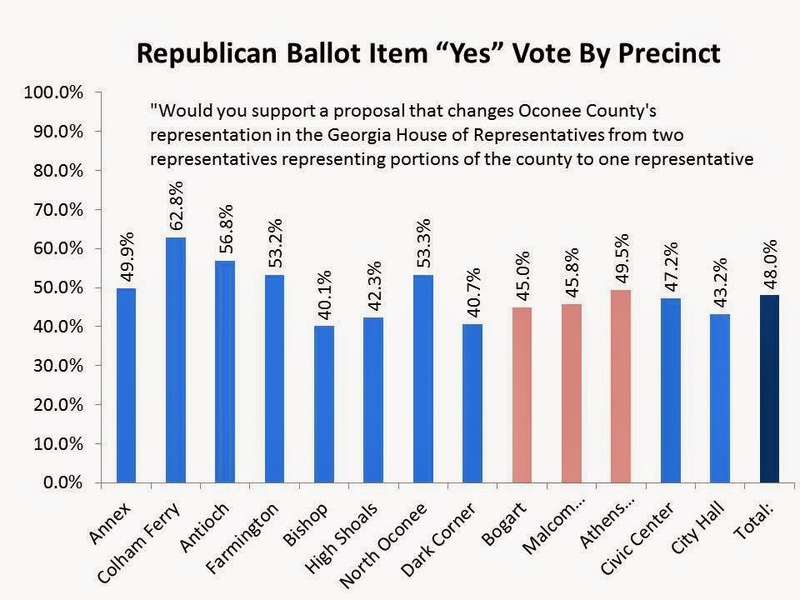 Jay Hanley, chairman of the Oconee County Republican Party, told me in an email message on May 24 that the idea for the ballot question was a “mutual idea among my committee and the legislators” for the county. “It was felt that if the measure passed it might even give our legislators more weight with the Reapportionment Committee to show a ‘real poll’ of voter opinion on the issue,” Hanley wrote to me. The language the party chose asked voters if they favored making a change from the existing two-representative situation to one representative. "Would you support a proposal that changes Oconee County's representation in the Georgia House of Representatives from two representatives representing portions of the county to one representative representing the entire county?" Voters wanting to make a change made up 48.0 percent of the ballots cast, based on the uncertified election results. In all three of the county precincts that fall in House District 117–Athens Academy, Malcom Bridge and Bogart–only minorities favored reuniting with the rest of the county to form a single district. A majority (52.8 percent) of those who voted before election day voted in favor of change, while only 45.9 percent of those casting a ballot on election day voted “yes” on the ballot item. 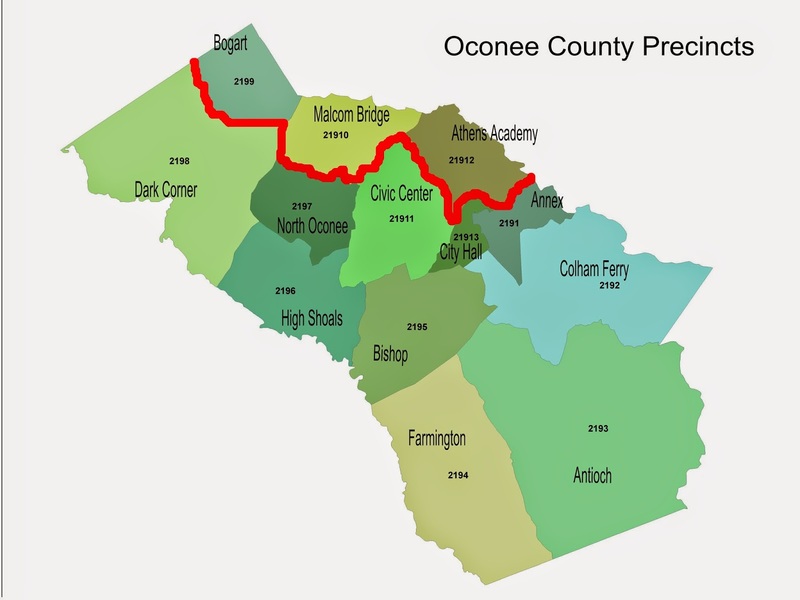 Oconee County had been in a single House district from 2002 to 2011. The House voted in its special session of 2011 called to redistrict in response to the 2010 Census to split Oconee County into two districts, the 117th and the 119th. Oconee County had made up the majority of the old House 113 District. It is the minority in both the 117th and the 119th. Clarke County is slightly dominant in the 119th and has the largest block of voters in the 117th, which also includes pieces of Barrow County and Jackson County. The redistricting was designed to create two Republican districts. The old 113th had historically voted for Democratic candidates and had elected Doug McKillip as a Democrat in 2010. McKillip switched to the Republican Party after being elected in 2010. Quick defeated McKillip in the Republican primary in 2012 and went on to election without a Democratic opponent. She made a campaign promise to attempt to reunite Oconee County in a single district if elected. Quick tried unsuccessfully to get redistricting legislation introduced in the 2013 session, and she and Williams jointly sponsored a bill in the 2014 session to that effect. The bill did not even get a hearing in the House Reapportionment Committee. Oconee County Board of Commissioners Chairman Melvin Davis had asked a legislative committee before the redistricting session of 2011 to keep the county whole in a single House District. And the Board of Commissioners voted unanimously in 2012 to support Quick and Williams in their efforts to reunite the county in a single district. None of this background was explained to voters on the May 20 Republican primary ballot, and the Oconee County Republican Party Executive Committee did not run an information campaign before the election. Williams told me in an email message on May 23 that he was not certain what impact the vote will have and that he had not yet spoken with Quick. “I’ll be interested in OCBOC’s stance in light of the voters’ response,” Williams said. OCBOC stands for Oconee County Board of Commissioners. Quick has not responded to my email query about the impact of the election. Her office voice mail message said she has been out of the office at a conference this week. Quick and Williams are both Republicans, and neither had any opposition in the May 20 Republican primary. Neither has Democratic opposition in November. Oconee County had 21,964 registered voters on election day May 20. Of those, only 5,147, or 24.4 percent, cast votes. The official figures on the number of voters who asked for and cast a ballot in the Republican Primary has not yet been released. The uncertified results indicated that 4,564 voted in the Republican primary, or 88.7 percent of those voting on May 20. Of those 4,564 Republican voters, 4,343 voted in the advisory poll on redistricting, representing 95.2 percent of those casting a Republican ballot but only 19.8 percent of the total registered voters in the county. It is possible that those 4,343 Republican voters on May 20 are not representative of the sentiment of registered voters in the county. But there is no concrete evidence anyone can reference to support that argument.